Mike Burns, formerly Long Island's finest (now some bum living in the Outer Banks) reports that Dare County has a mandatory evacuation. Hurricane Florence, category 4 will be making landfall September 13th. To know Hatteras is to love Hatteras, and we wish it and its mad population well. Also the rest of the Southeast. 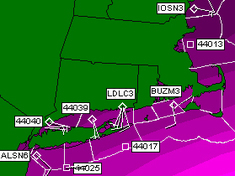 May this thing lose energy quickly, become a ho hum storm, and not mess with folks too much. Long Island Scores Big at OBX Wind! That's Route 12 approaching Rodanthe, according to a post I saw on Facebook, credited to @ryaneosmond. Astronomical high tides plus storm. Remembering a quote from Wind Tracks Magazine back in the day: "You always appreciate Hatteras, because you don't know if it's going to be there". Good luck to all residents and transplanted wind chimps. Fresh from losing my OBX wave virginity I was hot to get back on the water, but there were no wind/wave combos to be found Wednesday morning. “Why don’t you sail at Canadian Hole?” suggested Andy. So I went, and wrapped up my minivacation to Hatteras with a few hours of 7.0 sailing amidst the amiable crowd of windsurfers and kiters. Jibes, 360’s, push tacks, duck 360’s, backwind jibes etc…all the carving big-sail freestyle I could muster kept me happily busy skimming across those famous shallows. I started to get cocky, and so of course stuck the fin in the shallows for a not-too-bad face plant. Or two. Then the wind backed down and I spent an hour talking with Rochester windsurfers Gary and Michael. Gary hooked me up with a new yoga program that I want to try, and Michael told me stories about meeting Aaron the Human Catapult. The perfect stuff to dry off to before heading back to New York. The waves were small and there wasn’t a lot of wind, but I finally scored my first ocean session in Hatteras. I’ve been pestering my Outer Banks blogging buddies OBX Bill and Andy of Lost in Hatteras since I arrived a few days ago, and yesterday afternoon Bill told me to come meet him at…what was the name? They’ve got lots of exotic sounding (to me) launches down here…Ego Beach, S Turns, the Cove, Jockey’s Ridge etc. Bill told me to look for his Jeep, and when I found him I asked for the name of the launch. “We call it 'the first washout south of Oregon Inlet,'” Bill said. Not the stuff of song, but I didn’t care…I was gonna get me my first OBX ocean time! Me on a 5.5 and the big JP, Bill on a 5.3 and a skinny old-school 88 liter beauty (Bill is very efficient) planing was on-again, off-again as we poked around chasing the three foot (occasionally larger) waves while some dolphins checked us out (this was my first time sailing with dolphins, too.) I soon learned to imitate Bill and do a chicken jibe (or marginal facsimile thereof) when a promising wave began to set up. I’m a poor judge of forming waves, but I managed to catch three that were a lot of fun…for me to get four or five bottom turns on a wave was a joy. We were at it for a couple of hours before the wind died…a nice little sunset sesh. Now that I’ve had my first tidbit taste of la wave OBX I want more, but I’ve got to head back to New York soon, and if that’s all I get here I’ll be happy to say I’m happy. I needed a Hatteras fix, a window of opportunity opened, and an Andy Alert* promised afternoons of sweet thermals in warm waters. I hemmed and hawed for a few hours, then threw a sleeping bag in the van and headed out of New York at 6AM Monday morning. Nine hours later I was speaking to Andy face to face, who explained the intricacies of an offshore Bermuda High vis a vis the wind, before I drove down to Canadian Hole to wait for it to blow. But the wind did not come, and after receiving some email with bad news I was just about miserable in paradise. Then came a new Andy message to drive 15 miles north, and I did. Eighteen warm and wonderful knots had me zipping around the Pamlico Sound behind Barton’s shop, sharing the water with about a dozen other windsurfers and kiters. I optimistically put on a shorty (turned out I only needed a bathing suit, so warm was the water) and spent a few hours in my own private jibe and carving freestyle festival, as the sun and sky put on a signature electric gold Hatteras sunset. At one point I unhooked and leaned way back, with my eyes perhaps six inches above the water flying past my cheek. Saturday afternoon winds were light...10-15 knots. Windsurfers and kiters were on the water off of Avon with big lightwind gear. 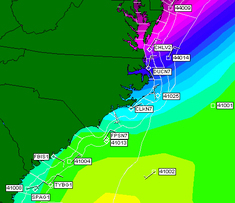 A cold front blasted through around 5pm, with gusts up to 40mph, flattening any number of sailors and kiters. Shortly after two apparently inexperienced kiters got worked just off of Island Creek, a third kiter launched, and was seen intentionally getting massive air...30 foot jumps at least. He appeared to be quite capable. Then the kiter got into trouble during a high jump, hit the water hard, and was dragged several hundred yards downwind until his kite grounded on one of the islands. People rushed out to help him and administered CPR, and an emergency unit soon came to take him to the hospital. The kiter, identified as Timothy Holman from Sarnia, Ontario, did not survive. I saw most of the kiting chaos since we were BBQ'ing in the back yard. Prior to the wind switching, I stood there scratching my head as the house next door proceeded to pump up every kite in their quiver - they had more kites than people laying there on the lawn, just upwind of where we were standing. Then they launched a couple beginners on big kites, the wind began switching and chaos ensued. At this point things began looking dangerous, so we sent the small kids inside, and minutes later one kiter was struggling near the dock (lines apparently caught), while another one was bouncing along 50 yards at a time, like a slow-motion train wreck, headed towards the docks, rocks and houses. Two others upwind were struggling, but at least in control and slowly making their way back. Despite all this chaos and the obvious 30-40 mph wind, we saw another more 'experienced looking' kiter from a different house launch on a small kite. He seemed to be in control, and started launching into giant jumps. My attention was divided between him and the two other kiters upwind, so I didn't see the actual crash, but Mike's friend Scott said he landed on the water sideways. We watched as his kite slowly floated downwind towards the island, and we knew something was wrong. We could only see the kite, but it must have been dragging the kiter through the water. Here is a report from the Island Free Press. People go to Cape Hatteras with such enthusiasm, joy and expectation of a wonderful time on the water. My heart goes out to his family and friends. I've been looking for an excuse to link to Lost In Hatteras Andy's post about surfing with dolphins, which is one of the best stories I've read in the windoblogosphere lately. Go read his tale of "Stu and the Local Boys"...you won't be sorry. I never found an editorially plausible tangent to bring up Andy's post, but considering that I am just about bursting at the seams with desire to go down to Hatteras, and tormented by the horrifying fact that Peconic Jeff is en route to the Outer Banks as I peck away at these stupid computer keys, I had to do SOMETHING. So I'm looking for windows of opportunity to roll down and catch up with Andy, OBX Bill, and all the usual suspects, on the warmer waters of NC. Alas, the combination of wind direction, heavy currents, and preceding days of nuking winds produced conditions which were hazardous to my health, had I ventured into the ocean. Damn. Poor me...I was stuck with 5.0 and 5.5 conditions windsurfing the Pamlico Sound, while Ted, Rob, Peconic Jeff and I chased Mike Burns around in a micro freestyle frenzy. Today I return to New York. The forecast is for wind on Sunday...more Peconic adventures. *Ace is surely better than me now. His name is Ace...how can he not be? Got Wind? In Hatteras We Do. Mike Burns wasn't kidding when he said the forecast for the Outer Banks was tremendous. Fortunately this morning lightened up a bit, so a few hours of 4.7ish sailing was available for the early birds (Ryan, Robert, and me on a 4.5). By late morning the switch got flipped, though, and it back on the three meter sails for all of us. Windfest begins Today, and there's been some talk in the windsurfing blogosphere of a windsurfing blogger summit (or more humbly, the chance that some of us will get to meet in person.) I said hi to Lost In Hatteras' Andy Tuesday. I'd actually met him before but hadn't put the two together. We'll see what turns up today...the winds are already blowing! Scene: A sunny, windy day in Cape Hatteras. You are there, with friends and all of your windsurfing equipment. What could be wrong? The answer: Too Much Wind. We were on our smallest sails...Jeff on a 3.5, Mike on a 3.7 Ted with a 3.7 and me on a 3.4. We were all overpowered. And this was in the morning when the wind was lighter. The routine was to sail for twenty minutes, get out for an hour and talk about how difficult the windsurfing was, then go out and sail some more. By 3PM, a 3.0 would have been too big. The shops in Hatteras don't carry anything smaller than a 3.4. * It was the strongest sustained wind I've ever sailed in. Later, in the hot tub, Ted, Mike, Jeff and your editor discussed the day over hot water and beer. When whitecaps began to appear in the hot tub, we knew it was REALLY windy. * CORRECTION: Olaf from the Avon Sail Shop has informed the Puffin that they stock Simmer sails down to 2.7. One more reason to check out Margaret and Olaf's excellent repair and gear shop! 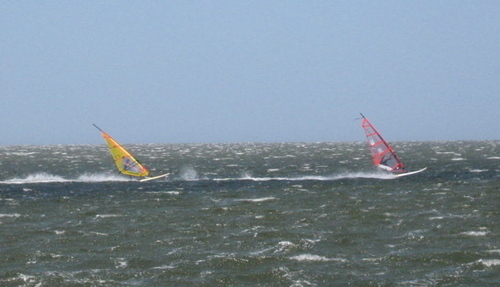 (Photo: Windsurfers tear it up on the Pamlico with tiny sails in 40 knot gusts. Where is the Wind? In Hatteras. George Pav has lamented the lack of wind for April (normally an outstanding month for Long Island.) "Where is the wind?" he asks? In an unlikely turn of events, I have found the wind, in the Outer Banks. I'm here with a Long Island windsurfing crew for a few days. Today's forecast is typical. I must go rig my 3.4. "45 degree water is tough"
You do not know what cold is! 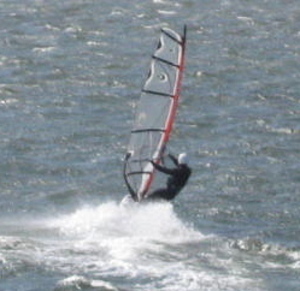 The Long Island windsurfer is sailing in 38 degrees. We look forward to 45 degrees...that will be balmy! We real men like the air above 30 degrees, and no floating ice in the water (though we've sailed through slush.) Give me a drysuit and dermatone, and if it splashes, I'll shred on it! In other Hatteras news, there is talk of a blogger summit down OBX way sometime around April's Windfest. Interest has been expressed by OBX Bill, Lost in Hatteras, Mac and James. I predict the list grows. Will we pull it off? Speaking for myself, every time last year I'd planned a quick trip to the Graveyard of the Atlantic, the forecast would start hopping up Long Island way and I'd stick around. Still, it could be worth the hike!